For Stankowski, the discovery of visual ideas was a process, and had less to do with being kissed by the muse. And so training was required. His sketchbooks are evidence of how many ideas he had, and how multifaceted his innovative thinking was. They are one of the most important of Stankowski’s legacies. Since the 1950s, he had been using pen, quill, and brush to fill the “empty books” given to him by his friend, Walter Cantz. 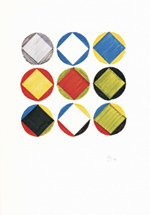 When, in the 1980s, he withdrew from his post at his studio, they became his visual journals. 116 sketchbooks shelter his artistic treasures; each one contains about forty pages. 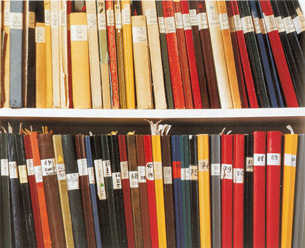 Even as a student, Stankowski was working with loose-leaf sketchbooks in a practice of visualizing thought. He was convinced that it was possible to penetrate unknown areas through the image, through visualized thought. In his experiments in the field of forms, information tied to themes is not as important as the systematic. “Systematics” was a favorite word of Stankowski — although he knew that his ideas had to be approached with equal amounts of logic and imagination. “Everything that is alive strives to grow, and thereby to perfect itself.” Behind this statement is concealed a self-portrait of Stankowski and the forces that drove his work. Yet perfection was not the focus, but rather the search for different artistic means for expressing content, form, and variation.